While I’m on the topic of fermenting things in crocks, I might as well share my sauerkraut saga. The most common reaction to my homemade sauerkraut is “I hate sauerkraut, but I love this!” Making your own kraut is easy, fun and delicious. Most people associate sauerkraut with Eastern European fare or German cuisine, but pickled cabbage actually has its origins in ancient China. Records indicate that over 2,000 years ago, workers building the Great Wall were sustained on a diet of sauerkraut and rice. Their version of the dish was made by fermenting cabbage in wine. One can imagine they did not save their best vintages for this purpose, and most likely the acidic wine served to preserve the cabbage. The history of pickling goes back over 4,000 years, with the first written records coming from India. Pickling is a means of preserving the harvest through the use of salt and acid. There are two basic types of pickling. The first uses a brine to draw water out of the item to be preserved, and then the water is replaced with vinegar or another acidic liquid. 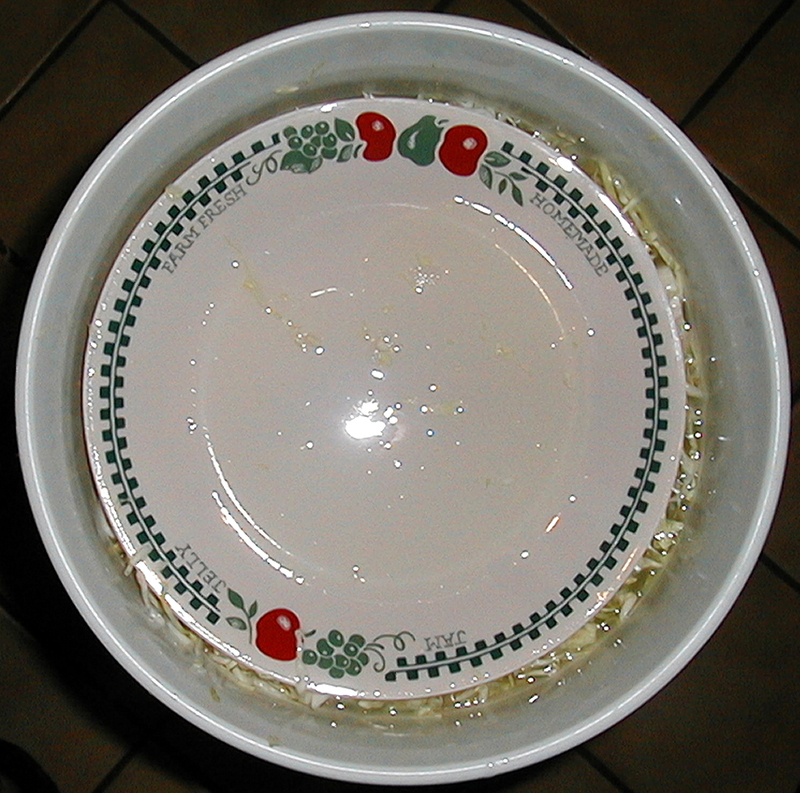 The second method uses a brine to create proper conditions for fermentation which produces acid needed to preserve the pickled item. Sauerkraut falls into this second category. 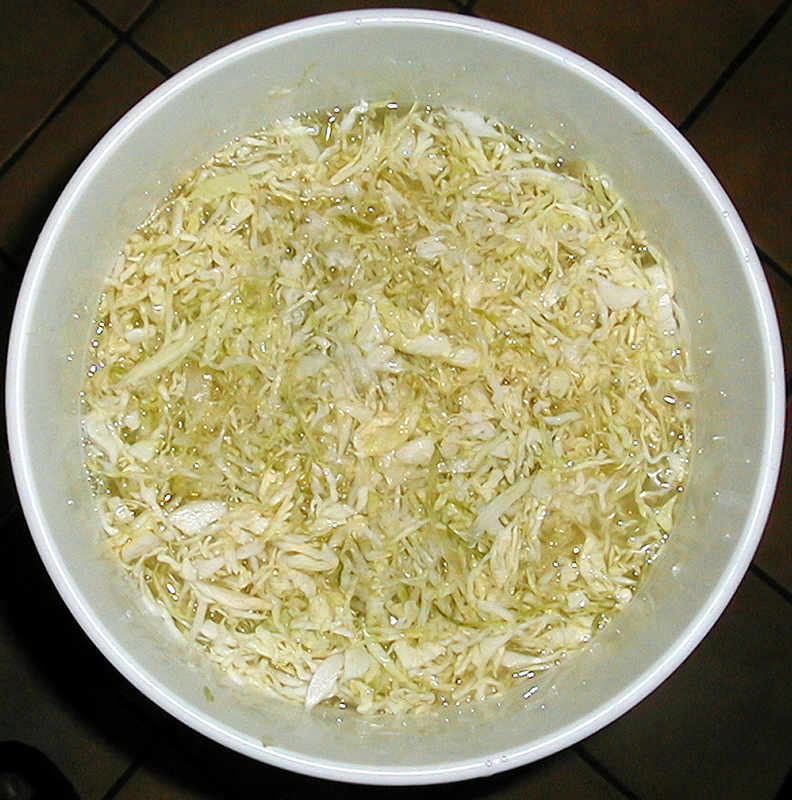 Sauerkraut is made by mixing shredded cabbage with salt. According to Harold McGee’s wonderful book, On Food and Cooking: The Science and Lore of the Kitchen, this mixture creates the proper environment for the lactic acid bacterium Leuconostoc mesenteroides to grow. When the pH drops sufficiently, then the conditions become right for Lactobacillus plantarum to take over. My own experience in making kraut shows that as long as you take simple precautions to avoid making conditions right for various wild yeasts and molds, it is pretty easy to make some of the best kraut you’ve ever tasted. My first batch of sauerkraut was made in 1985. I obtained a ceramic pickle crock and a copy of USDA Home and Garden Bulletin Number 92 (Making Pickles and Relishes at Home). 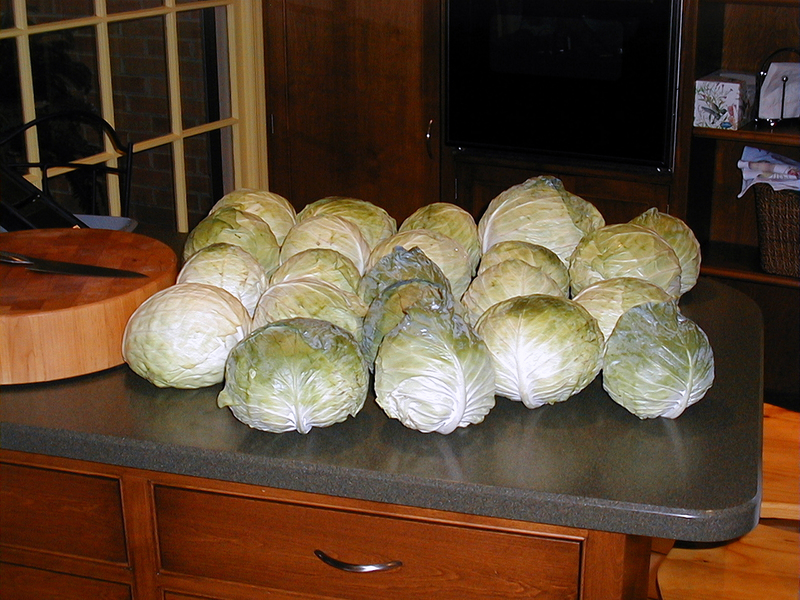 I packed the salted cabbage in the crock and left it on my dining room table as I left for a business trip. When I returned, I found a crack in the crock’s glaze had allowed the brine to slowly leak out of the crock. My apartment was ripe! The kraut was wonderful. My grandmother, who had been pickling vegetables her whole life, told me it was the best she’d tasted – when could I get her some more? I was hooked. Seven-gallon plastic food grade bucket. Plastic is lighter than a crock, and you should not need to worry about leaks. I use one of my early plastic bucket home brewing fermenters, but if you do not have one, food grade buckets are easy to come by for resourceful home brewers. This size bucket will hold a full case of cabbage (about 50 pounds). I also have several 10L Harsch pickling crocks; they hold about 15 pounds of cabbage each. Slicer. I have used a food processor, a knife, a mandoline, and a special purpose kraut cutter. The food processor is limited by the size of the feed chute and often leaves some big pieces that will not ferment evenly. A knife does a fine job, but it is painfully slow. Both the mandoline and the kraut cutter produce large thin slices that give the finished kraut the best texture, in my opinion. Use a knife to finish off the last bits that you can’t feed into the mandoline without slicing your fingers. Good mandolines are expensive, but you can get an inexpensive one for this job and the few other things you might use it for around the kitchen. If you make a lot of kraut, get a kraut cutter. Mixing tray. 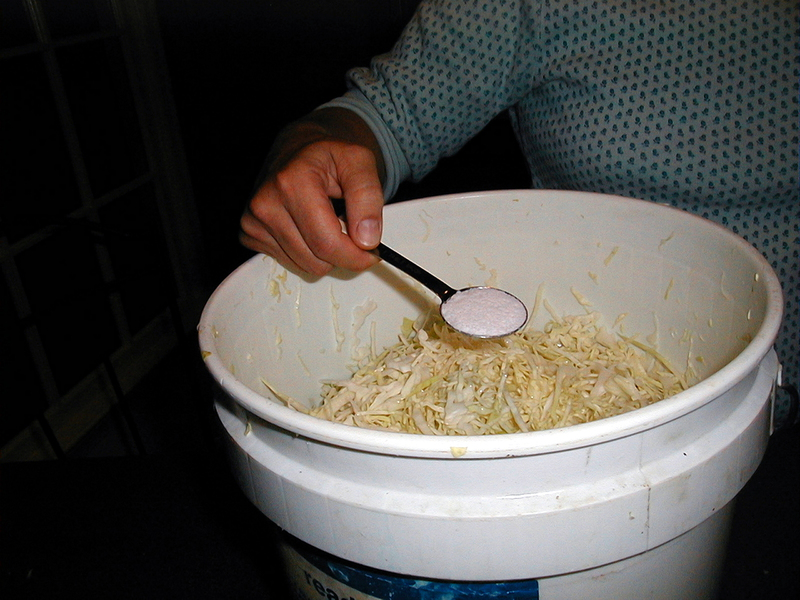 You need a large tray to hold five pounds of shredded cabbage to mix it with the salt before packing in the bucket. Scale. 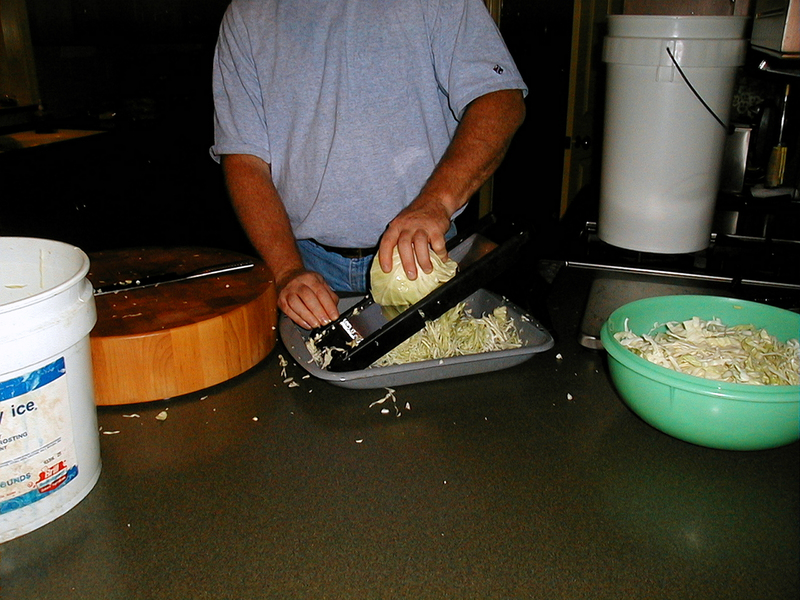 A kitchen scale is used to weigh out cabbage for mixing with salt. Large, non-reactive kettle. This is for heating the fermented kraut before packing in jars for final processing. Canning jars and canning kettle. 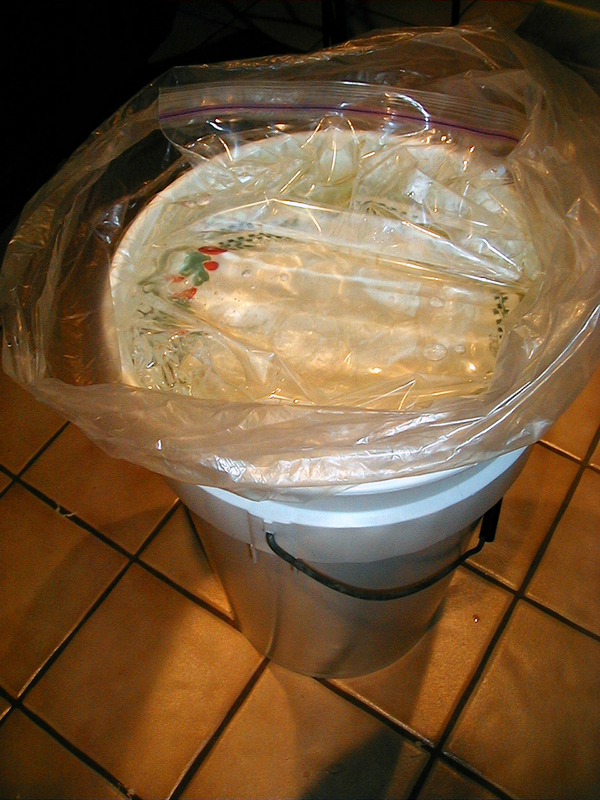 You can keep your kraut in the fermentor and use it from there, but for longer term storage, you probably want to can it in a boiling water bath. My wife, Dot, and I work as a team in making kraut. We buy a full case of cabbage for each batch. Local markets charge $10-12 for a nominal 50 pound case. Over the years we have gotten a lot of stares going into supermarkets and filling a cart with cabbage! 50 pounds makes about 14-18 quarts of finished kraut. Cleaning the cabbage is a must. Dot pulls off the outer leaves, washes each head under cold running water, quarters the heads, and slices out the core from each quarter. Leave just enough core to hold the head together. I slice the cabbage and put the cabbage slices into the mixing tray. Placing the tray on a scale makes it simple to work the five pound increments. Once I have five pounds in the tray, I measure out three tablespoons of pickling salt and sprinkle it over the shredded cabbage. Mix this thoroughly to ensure even salt distribution, then let it wilt for about five minutes. Dot comes back into action to punch the wilted cabbage into the fermentation bucket. It has to be packed tight with no air pockets. There should be a lot of juice present at this point, so getting the air out is usually not an issue. When all of the salted cabbage is packed into the fermentor, I place one of our finest pieces of dinner china on top of it to weight it down. You may choose to use your everyday china instead. On top of the plate, I place a large food-grade plastic bag. Inside the bag I place two two-gallon ziplok bags full of water to make a complete seal. 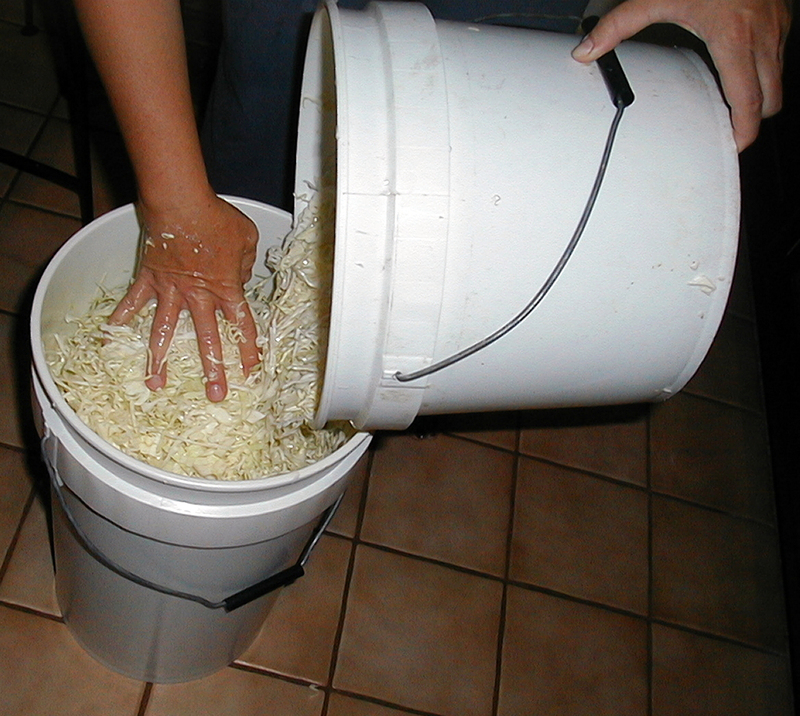 The pressure of the bags against the inside rim of the bucket is sufficient to keep out debris and it prevents the kraut from being exposed to air. I have never had a problem with mold or wild yeast with this technique. At about 70F, fermentation takes about four weeks. You can periodically lift the bags to check on the color and odor of the kraut. You can even sneak a bit of it before it is fully fermented; it will still be pretty good. 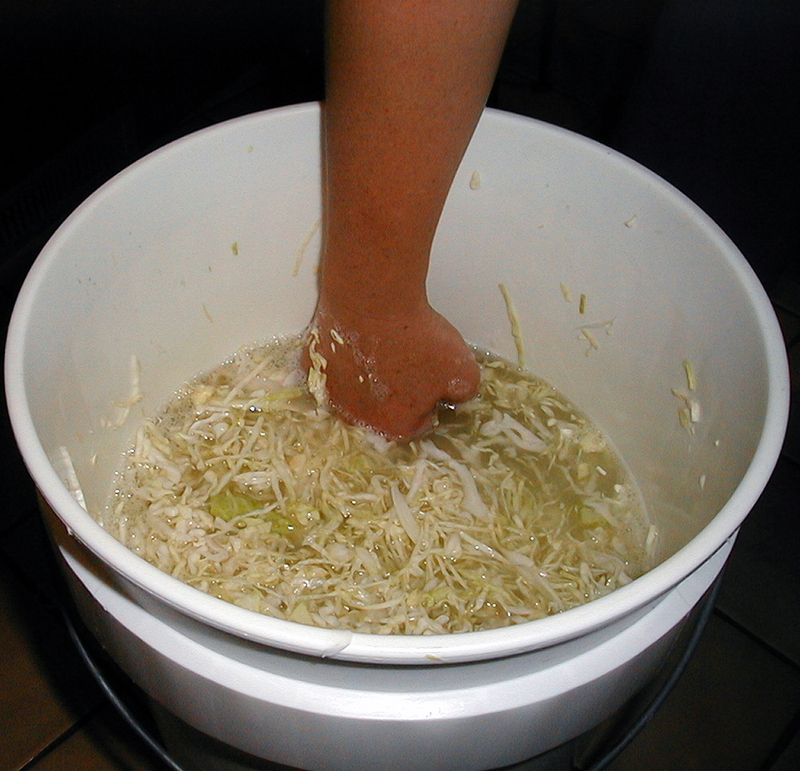 When fermentation is done, heat the kraut in batches in your large, non-reactive kettle. When it is simmering (185-210F), pack it into hot sterile canning jars. Seal with new lids. Keep the jars warm in a 200F oven until you have enough to process in your boiling water canner. Place the jars in the rack in boiling water in your canner. Water needs to cover the lids. Process quarts for 15 minutes from start of boil (0-1,000 feet above sea level), 20 minutes (1,001-6,000 feet), or 25 minutes (over 6,000 feet). 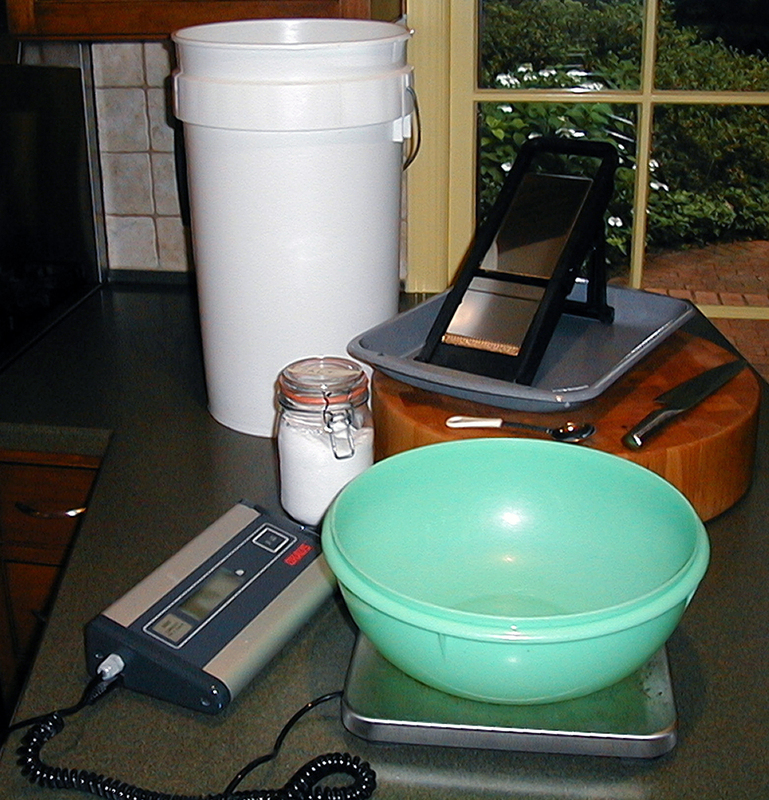 Due to the acid content of the finished kraut, pressure canning is not necessary. Remove from canner, space the jars out by two to three inches on a heatproof surface, and cool to room temperature. Check the seals and refrigerate any jars that do not seal. 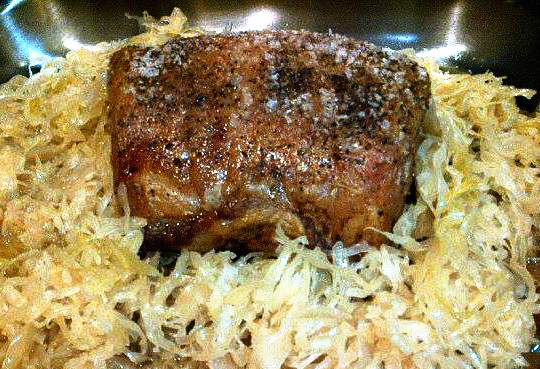 To enjoy your kraut, take it from the jar and heat in a sauce pan to serve as a side dish, or you can place a browned pork roast on a bed of kraut to finish in the oven. An easy weeknight dinner would be to brown some sausages or seasoned pork chops in a fry pan, and then place them on a bed of kraut in a small roast pan to finish in the oven. The meat juices make the kraut even better. Serve with horseradish mashed potatoes and your finest homebrewed Oktoberfest. Try a Reuben sandwich with your own kraut; stuff kraut into banana peppers and can those for a great beer snack or sandwich topper, or try kraut on a hamburger. OK, you get the idea; we eat a lot of kraut at our house. True to our Pennsylvania Dutch heritage, we know how to eat till it hurts. Sidebar from USDA Home and Garden Bulletin Number 92: Making Pickles and Relishes at Home. 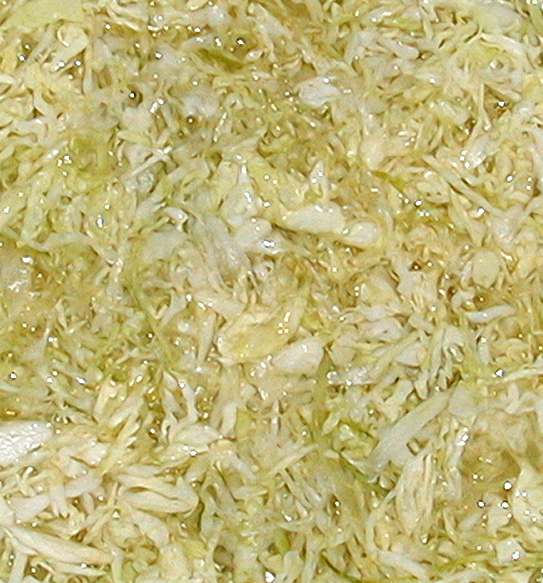 Off-flavors and off-odors develop when there is spoilage in sauerkraut. Spoilage in sauerkraut is indicated by undesirable color, off-odors, and soft texture. Too high temperatures during fermentation. Air pockets caused by improper packing. Pink color in kraut is caused by growth of certain types of yeast on the surface of the kraut. 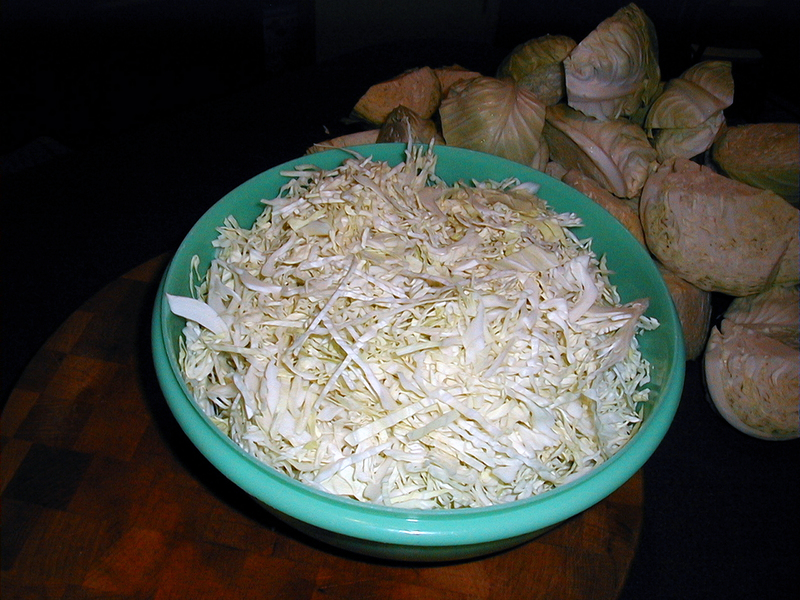 These may grow if there is too much salt, an uneven distribution of salt, or if the kraut is improperly covered or weighted during fermentation. 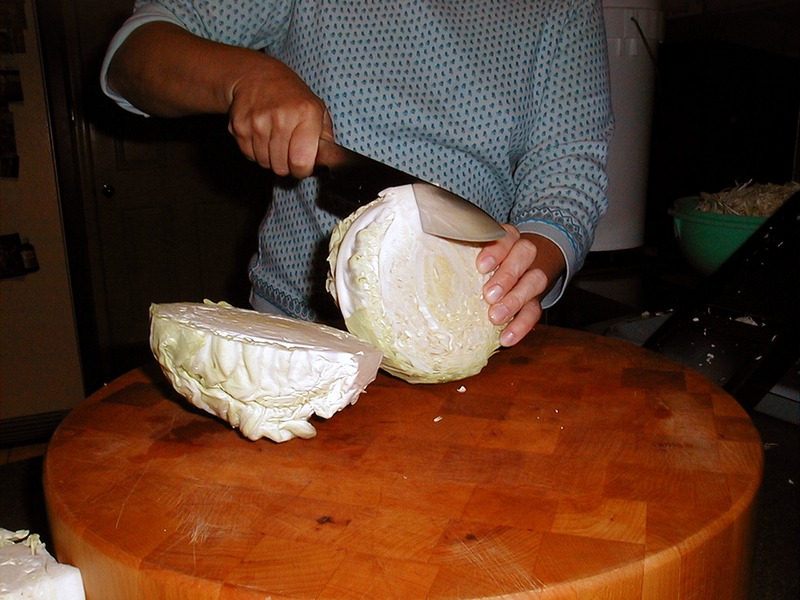 This condition in kraut is usually found at the surface where the cabbage has not been covered sufficiently to exclude air during fermentation. Unwashed and improperly trimmed cabbage. Insufficient juice to cover fermenting cabbage. High temperatures during fermentation, processing, and storage. “Complete Guide to Home Canning”, Agriculture Information Bulletin No. 539, USDA. Reviewed 1994. McGee, Harold. On Food and Cooking: The Science and Lore of the Kitchen. New York, Collier Books, 1984. United States Department of Agriculture. Making Pickles and Relishes at Home. Washington, DC, U.S. Government Printing Office, Revised 1978. Doing my first batch of kraut. I’m not clear on whether to use a water trap, like we do with beer, or a cloth covering, during fermentation. My instincts tell me to use a water trap but almost all the kraut recipes on the net talk about layered cloth over the top of the jar/crock. What’s your experience? You have to keep air out. See in this post how I weighted it down with a plate and a bag filled with water. Good luck!